Location:: At the supposed location of the Israelite citadel's outer wall - overlooking the cities of Jerusalem & Bethlehem . Dimensions ::length (top platform) – 10 m', the spiral's largest diameter–7 m', height (higher to lower level)– 3.5 m', total height – 7.5 m'. 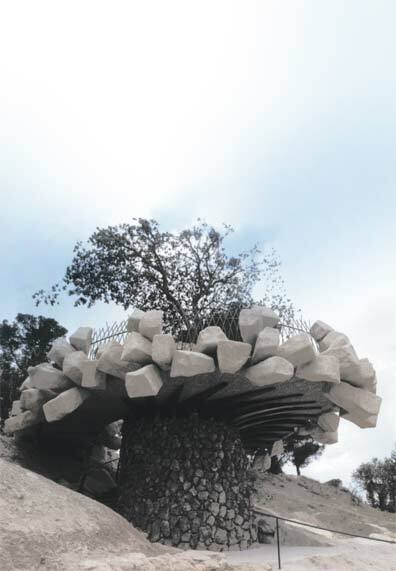 Materials:: concrete structure, oak tree (Quercus itahaburensis), fabricated stones, flint stones, steel rods. 1998 planning, permits, transplanting process, excavations, foundations (May), structure (July), fabricated stones (November), archaeological excavations (December). 1999 transplanting, upper level, surrounding garden, opening (June). Key Meanings : Creative Preservation , 'reconstruction' of the archaeological hypothesis, spiral echo of the Protoaeolic motif, midway between Jerusalem & Bethlehem , in memory of Y. Engel. Artist Statement : By reconstructing the spatial point where the wall is supposed to have existed, and thus giving a sort of reality to the archaeological hypothesis, one can experience the strategic qualities of the site… Artificial in material, speculative & imaginary in their placement, the fabricated stones attempt to lead a thread of memory to the unmoved (and rigorously authentic) realities of this specific location.